The first time he looked round he said: "I can see nothing." The secoud time he looked round he said: "I can still see nothing." But the third time he said: "I see a mighty army in the distance, and one of the warriors has the biggest lance you ever saw!" This was the cat, who was marching along with her tail erect. 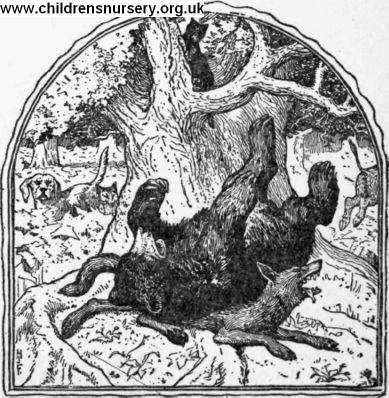 the bear said: "The enemy won't be here at this rate for many hours to come, so I'll just curl myself up in the fork of the tree and have a little sleep." And the wolf lay down under the oak and the wild boar buried himself in some straw, so that nothing was seen of him but one ear. And while they were lying there the fox, the cat, and the dog arrived. When the cat saw the wild boar's ear she pounced upon it, thinking it was a mouse in the straw.